Two months from the year 2019 have passed and the global aluminium industry is consolidating without much volatility in prices of the metal and the raw materials. Most of the supply uncertainties are over as the issues are likely to be managed soon. Alunorte will soon start full alumina production and sanctions on Rusal have been lifted. Trade wars between the U.S. and China are likely to see the end soon and the U.S. will soon come to a decision on the tariffs on aluminium from its closest allies like Canada and Mexico. China’s environmental shut downs will come to an end in March and this year, it was not as stringent as in 2018. China’s aluminium production usually shrinks in January as production slows ahead of Chinese New Year. The country continues to boost its alumina output due to growing demand and export potential. The world’s biggest aluminium producer and exporter would continue to play a significant role in 2019. Let’s have a quick look at how the China Aluminium Market moved in January and February. In January, China’s production of metallurgical alumina stood at 6.13 million tonnes, up 7.4% YoY, with average daily output at 198,000 tonnes, 1,000 tonnes lower on the month. Gas installation at Chiping Xinfa, rectifications for ultra-low emission at Chinalco Huaxing, and environmental renovation at Shanxi refinery affected daily production. Chinalco Shanxi produced lower in last month, and environmental curbs in Henan province affected local output. In Shanxi, Henan, and Inner Mongolia, tight supply of natural gas also affected alumina production in January. SMM expects average daily output of alumina in February to rise 2,000 tonnes from January to 200,000 tonnes, as some refineries boosted operation during Chinese New Year after the environmental checks had saturated. Shandong Xinfa resumed regular production this month. February alumina output is estimated to stand at 5.61 million tonnes, up 10.5% from February 2018 and down 8.4% from January 2019. China produced about 2.97 million tonnes of primary aluminium in January, down 0.5% from January 2018, and down 0.7% from December. By the end of January, domestic primary aluminium capacity stood at an annualised 34.96 million tonnes, down 270,000 tonnes from December. Despite new capacity coming online, capacity cuts at Shaanxi Hengkang, Shandong Huayu, Shanxi Huasheng, and Shanxi Huaze brought down operating capacity in January. Due to fewer working days in February, SMM expects China’s primary aluminium output to come down 1.1% YoY to 2.7 million tonnes. By the end of February, domestic primary aluminium capacity under operation is forecasted at an annualised 35.14 million tonnes. According to the National Bureau of Statistics (NBS) data released on Thursday March 14, China’s production of primary aluminium in January-February increased 5% year on year, to stand at 5.69 million tonnes. The data matches to SMM forecasts for February. 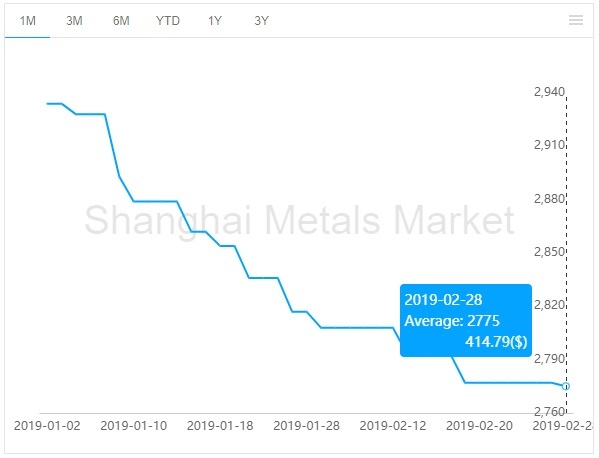 Lower aluminium price in China during the beginning of 2019 put downward pressure on the market. Alumina accounts for around one third of the cost of aluminium production. The low aluminium price has compelled some unprofitable smelters to suspend operations, which put pressure on alumina demand and was leading to a build-up in alumina stocks in China. Supply of alumina is set to increase as a result of new alumina projects launched by Chinese companies in Indonesia and Guinea and imported alumina market is also set to have ample supply with new projects coming in Australia. In the month of January 2019, the average domestic alumina price stood at US$ 423 per tonne. The prices are on a stable downward curve starting at US$ 428 per tonne in the beginning of January and reached US$ 415 per tonne at the end of February. The average domestic alumina price in the month of January and February stood at US$419 per tonne. The prices were falling consecutively during January and February as shown in the below graph, but within a tight range. Alumina prices were more or less consolidated and had not registered a sharp rise or fall during the first two months. Looking at the trend Chinese domestic alumina prices are likely to be at a range of US$ 375 to US$ 415 per tonne in the first half of 2019. China aluminium price was at historically low levels in the beginning of January, which has also put downward pressure on the market. In the beginning of January China aluminium price stood at RMB 13310 (US$1943.5) per tonne. However, prices started rising from the third week of February with the upward growth in LME counterpart and consumption growth in China. During the end of February, China aluminium prices registered a substantial rise and stood at RMB 13600 (US$2037) per tonne. Average aluminium spot price in china for January-February stood at RMB 13366.22 per tonne or US$1975.17 per tonne. 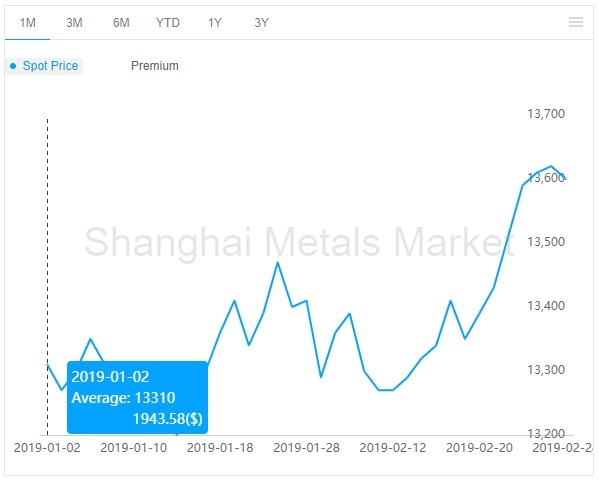 According to Shanghai Metals Market, social inventories of primary aluminium across eight major consumption areas in China, including SHFE warrants, stood at 1.3 million tonnes as of Wednesday January 2, up 16,000 tonnes from Thursday December 27. The inventory continued to increase over January and February mostly driven by lower consumption. Social inventories of primary aluminium including SHFE warrants, stood at 1.744 million tonnes on February 28. 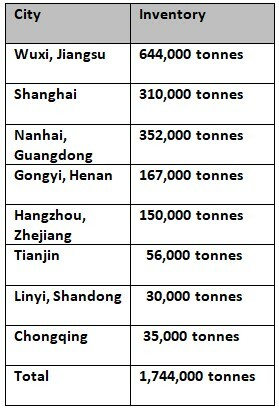 The chart below indicates the status of the primary aluminium inventories across China on February 28. In 2018, China reversed the trend of being an importer of alumina and started to export. The exports of alumina for the period January 2018 to November 2018 was around 1.29 million tonnes compared to 0.46 million tonnes of imports during the same period. The producers of alumina in China were taking advantage of the supply concerns prevalent across the globe. However, the trend started to fall from the beginning of January. According to the latest data from China Customs, China’s alumina exports in February came in at 3,443 tonnes, after declining 139,000 tonnes from January. This data represents that China’s alumina exports in January 2019 stood at 142,443 tonnes. The exports in January were 34,987 tonnes or 20 per cent lower than 177,430 tonnes in December, which again was 37.9 per cent down from 285,696 tonnes in November. Imports of alumina stood at 50,000 tonnes last month, down 47.2% year on year and exceeded exports by some 47,000 tonnes. With the saturating supply concerns in the global alumina market, China’s export of alumina is expected to have a limited upward growth in 2019. Imports will pick up if the domestic demand starts growing. China Aluminium Market is one of the most leading importer for aluminium raw materials and it remains the leading exporter of aluminium products. China’s exports of aluminium sheets/plates and strips stood at 418,600 tonnes in January-February, up 9.6% from the same period last year. January export stood at 245,900 tonnes while February export dropped about 30% month on month to 172,700 tonnes. Year on year, February total is down 2.2% from the volume exported in February 2018. The February figure is the lowest since February 2017. China’s export of aluminium foil, under five HS codes, registered 87,600 mt in February, down 22.8% from January’s exports of 113,500 mt, but up 0.7% from the 86,900 in February 2018, the latest customs data showed. In February, China’s exports of aluminium extrusion, bar, and rod had reduced to 42,500 tonnes, down 63.81 per cent from the previous month and 25.6 per cent from the same period last year. Shanghai Metals Market believed stronger yuan, holidays, and tariffs concerns were some of the factors that led to the decline in exports. A number of factors will determine China’s semi-finished aluminium export in 2019 including anti-dumping investigations, trade wars and export tax benefits by the Chinese government.